MedSpan Research’s Mentions…Here’s a Tip! MedSpan Research finds that many consumers do not know the type of Medicare (Fee for Service vs. Advantage) or Medicaid (state vs. managed) insurance they have. When conducting an Internet survey with consumers, ask them to look at their insurance card to give you an accurate answer. For some years now, payers, academics and clinical practitioners have had concerns about the justifications for clinical practice patterns. The need for evidence-based practice ranges from formulary design to clinical care to radiology. For example, when clinicians, such as radiologists, health plan administrators, and others try to decide between imaging and interventional options, they may find that textbooks are out of date, guidelines are not specific enough and there are conflicting or apparently unreliable reports in the literature. Expert opinions and policies vary and even the definition of ‘evidence’ is unclear. Some experts recommend using the ‘consensus of experts’ approach. However, the reliability and reproducibility of this type of evidence is questionable. Others recommend the use of guidelines that are based on expert appraisal of the literature. These are roughly equivalent to a consultation with experts but may not answer our specific question well, be based on strong evidence or take into account new developments and local circumstances. However, when clinicians and health plan administrators go to the literature, the first problem encountered is the volume of literature being published and, perhaps, a lack of training in how to separate the good studies from the weak ones. Another problem is determining whether specific clinical decisions and medical policies should be based on the general consensus illustrated by the evidence or following a minority opinion that better applies to a specific situation or sub-group of patients. One of the issues facing healthcare manufacturers is how to best support clinicians and administrators as they address these challenges. For healthcare manufacturers, the key questions are 1) What type of data will my customers find most compelling? 2) How will that data best support my marketing efforts and support appropriate adoption of my product? 3) How can I develop the data most cost effectively? Is a retrospective study or an observational study sufficient? Is a costly prospective study with a randomized design necessary? 4) What return will I realize from the data I develop? The first step for healthcare manufactures is to realize the data are necessary. As comparative effectiveness research becomes more prevalent and clinical decisions are increasingly scrutinized, data is all that clinicians and administrators will find relevant and compelling. The next step is to develop an evidence plan early in the product development process. To the extent possible, the time to develop such data is when drugs are going through clinical trials or diagnostic assays and imaging equipment and applications are under development. Developing data after FDA approval and product launch could burn the limited commercialization time available before a competitor arrives or patent protection expires. The evidence plan should be based on the expected return on investment. If less-costly retrospective and observational studies will drive adoption, though perhaps not optimally, they might optimize ROI. Potential market blockbusters might warrant costly prospective, multi-center studies that support a lasting and profitable competitive advantage. The design of specific studies within the evidence plan should be based on the intended audience. Payers (eg, health plans and hospital administrators) are looking for value. That is the expected improvement in quality of care, based on specific and measurable outcomes, divided by the impact on cost. Cost includes that of the drug, device or imaging application as well as any cost offsets (eg, reduction in hospitalizations) directly due to the product. Providers are more focused on improvements in clinical care and outcomes and, to a lesser degree, cost impact. As today’s discussion begins to illustrate, the development of an evidence plan is a complex undertaking that should be well thought out. Today’s environment and its emphasis on comparative effectiveness, cost management and access to appropriate therapies and procedures makes the development of the evidence plan more critical than ever before. About one-quarter of the $700 billion per year – approximately $177 billion a year – is due to non-compliance with prescribed care regimens. Three out of four Americans fail to take their medicines as directed. Such non-compliance leads to unnecessary office visits, hospitalizations, and treatments. Patients’ financial responsibility for their medications is one reason for non-compliance. How does value based insurance design (VBID) work to reduce healthcare costs? VBID programs facilitate access to healthcare resources by reducing the patient’s financial responsibility. This facilitates compliance with prescribed therapy regimens. Let’s compare the potential for VBID programs for the diabetes population to the five characteristics listed above. (1) 23.6 million US citizens suffer from diabetes (Source: National Diabetes Information Clearinghouse http://www.diabetes.niddk.nih.gov/dm/pubs/statistics/#people; accessed July 7, 2010). At 7.8% of the US population, diabetes is highly prevalent. (2) The likelihood of comorbidities requiring hospital admissions, emergency department visits or additional treatments is significant for diabetes patients. Let’s look at the statistics, per the National Diabetes Information Clearinghouse at (http://www.diabetes.niddk.nih.gov/dm/pubs/statistics/#people; accessed July 7, 2010). Adults with diabetes have heart disease death rates about two to four times higher than adults without diabetes. The risk for stroke is two to four times higher among people with diabetes. In 2003 to 2004, 75 percent of adults with self-reported diabetes had blood pressure greater than or equal to 130/80 millimeters of mercury (mm Hg) or used prescription medications for hypertension. Diabetes is the leading cause of new cases of blindness among adults ages 20 to 74 years. Diabetic retinopathy causes 12,000 to 24,000 new cases of blindness each year. Diabetes is the leading cause of kidney failure, accounting for 44 percent of new cases in 2005. In 2005, 46,739 people with diabetes began treatment for end-stage kidney disease in the United States and Puerto Rico. In 2005, a total of 178,689 people with end-stage kidney disease due to diabetes were living on chronic dialysis or with a kidney transplant in the United States and Puerto Rico. Almost 30 percent of people with diabetes ages 40 years or older have impaired sensation in the feet—for example, at least one area that lacks feeling. In 2004, about 71,000 nontraumatic lower-limb amputations were performed in people with diabetes. (5) therapy compliance has been proven to lower co-morbidities and related costs. Years can pass before payers realize a return on their investment in VBID. Payers incur costs immediately. For example, payers incur costs for developing VBID programs and administering them. As well, treatment costs increase due to greater therapy compliance. It can take months or years before VBID programs generate cost savings. Accurately assessing the financial benefit of a VBID program can require the services of clinical researchers, health economics analysts and perhaps, actuarial consultants. The analysis often is quite complex and expensive. The net cost constituting the financial impact of the VBID program depends on whether the incremental expenditures on high-value services can be offset through a decrease in adverse outcomes as a result of enhanced compliance with the prescribed therapy regimen. Savings are likely to be enhanced by the program targeting specific patients at high risk of a preventable adverse event. As a result, VBID should be carefully implemented and targeted to the situations that meet the five requirements previously listed. Designing and implementation of VBID programs requires a thorough clinical study of the given patient setting followed by development of administrative protocols and monitoring of compliance with the protocols. Our discussion on VBID concept continues in our next blog article – evaluating return on investment. The Big Bad Drug Industry? A recent study by the Kaiser Family Foundation found that spending in the US for prescription drugs was $234.1 billion in 2008, nearly 6 times the $40.3 billion spent in 1990. Although prescription drug spending has been a relatively small proportion of national health care spending (10% in 2008, compared to 31% for hospitals and 21% for physician services), it has been one of the fastest growing components, until the early 2000’s growing at double-digit rates compared to single-digit rates for hospital and physician services. Since 2000, the rate of increase in drug spending has declined each year except for 2006, which was the year Medicare Part D was implemented. By 2008, the annual rate of increase in prescription spending was 3%, compared to 5% for hospital care and 5% for physician services. 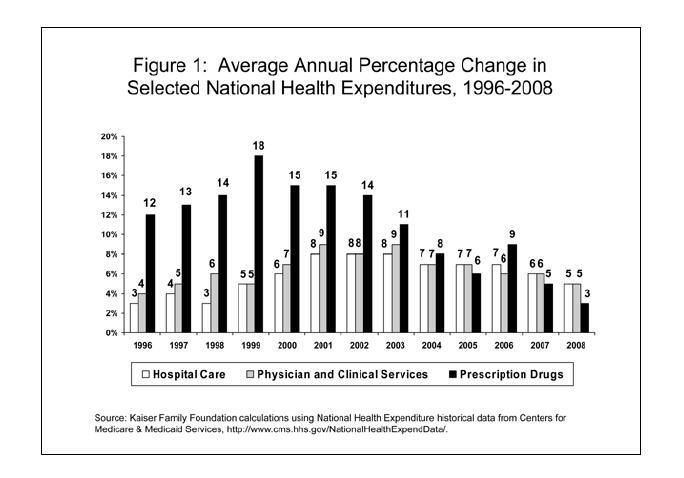 From 1998 to 2008, prescription drugs contributed 13% of the total growth in national health expenditures, compared to 30% for hospital care and 21% for physician and clinical services. A decrease in the number of new drugs introduced. This profile raises the question as to why the drug industry has been a major focus of the healthcare reform effort. Sure, some drugs cost more than $100,000 per dose. That is significant, even for people with insurance coverage, and not easily understood by many consumers and healthcare professionals. But given the limited portion of healthcare costs due to drugs, the significant rate of introduction of generic drugs, the lack of a significant drug pipeline outside of oncology and other, select disease states, there seems to be limited room for better managing these costs. Instead, the lack of a significant pipeline outside of oncology therapies should be a major concern. Pharmaceuticals offer the potential to improve outcomes while offsetting hospital and other healthcare costs. The United States should support research efforts into new therapies while encouraging appropriate choice of drug therapy and compliance with indicated therapy regimens. Such concepts as the patient-centered medical home and value-based insurance design should make inroads. Appropriate provider and patient education will encourage even better therapy choice and enhanced compliance. Let’s focus our energies in areas where cost savings and improved outcomes can be gained as there is significant room for improvement in the United States. Let’s not excessively beat up those who are seeking to improve healthcare outcomes in a cost-effective way.